Ah, Cuba. The more things change, the more they stay the same. 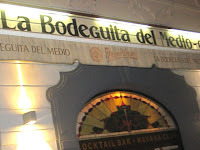 And that's my feeling about the restaurant, La Bodeguita del Medio. 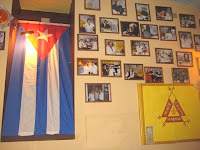 We used to go to this Cuban spot in Old Town fairly often when it opened some years back. Mojitos were all the rage, as they still are. But there was also good food that, while not cheap, seemed fairly priced. For some reason, we hadn't been back to this restaurant in more than a year. 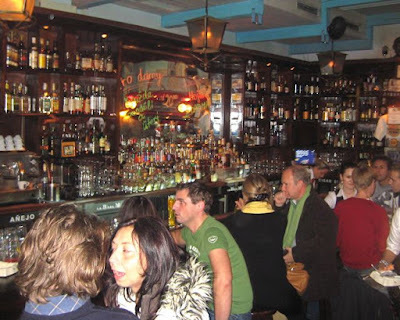 The small bar area was always packed back then, as it was on our recent visit. It can be hard to move around, much less find a seat. There was live music on a raised section next to the bar. It got quite loud, but I didn't mind too much. They played well, especially the guitar player, and covered some of my favorite Cuban tunes. There is a dining area upstairs, but I don't like eating up there as much. It feels too cramped to me. Reservations are a good idea, especially on weekends. We ate early and there were plenty of tables downstairs around 7 p.m. They filled up as the evening progressed. At the back end of the room was another bar. It was something of a mojito assembly line. The turned them out fast. 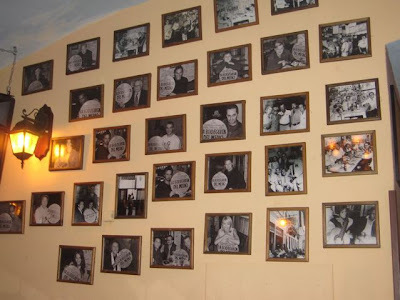 In front of the downstairs bar area, there was also live Cuban music, but it doesn't usually start until after 8 p.m.
On one wall, there were photos of Czech celebrities who have eaten at the restaurant. V pointed out one of the actors as the voice of the Czech version of Bart Simpson. They used to let people write their names on the walls with marker pens, but that tradition was gone downstairs. The graffiti was painted over. We started with some favorite appetizers we always used to get. I had the goat cheese and spinach salad (180 CZK). It was just as I remembered it. The goat cheese was cooked in a phyllo-type shell. 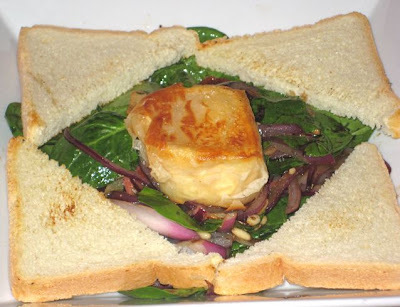 The spinach was coated with a relatively sweet balsamic dressing. There were also a lot of fried red onions and bacon, along with some pine nuts. The one disappointment also remained the same -- the sad white toast bread straight from the supermarket. 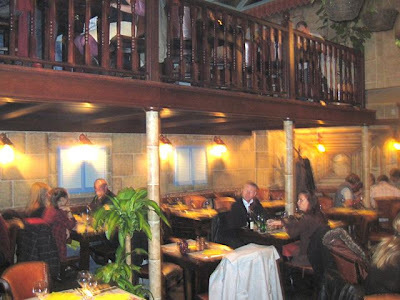 V ordered the tiger prawns "Cayo Largo" (258 CZK). 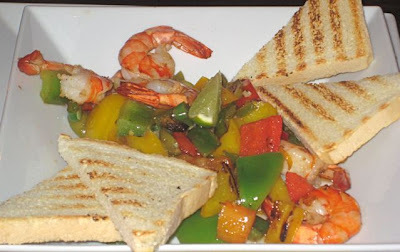 There were six shrimp on a mixture of peppers, garlic, and olive oil. She didn't enjoy it as much as a similar dish she used to order. The shrimp were good, but nothing special. She felt there were too many peppers, and not enough of anything else. The old version used to come out sizzling in an earthenware pot, but the new version was less exciting and blander. Again came the white toast. 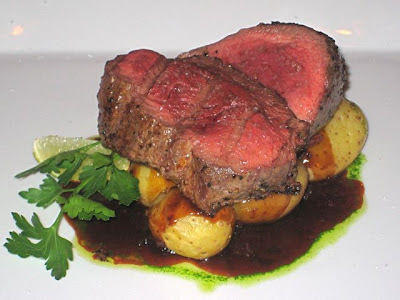 For a main course, I had the fillet mignon de solomillio a la parillia (430 CZK) and the Mojo potatoes (45 CZK). We both agreed this was the winning choice for the night. The meat had great flavor from the grill. The sauce was really delicious. It was described as a chili sauce, and it was fairly sweet. I thought it had an onion base to it. The new potatoes were a good match. Some minor points. I'd asked for medium rare, and it came out more rare, but it is difficult to get a thick cut like this right. The meat was not incredibly tender, but not tough either. V got the grilled octopus and calamari with black risotto and wild rucola salad (485 CZK). This was OK, but relatively disappointing. In the four compartment dish, two were filled with the octopus, calamari, cherry tomatoes and olives. It was only slightly warm and the seafood was a little dried out. The risotto has a very nice flavor, but again, should have been hotter. I don't know what was "wild" about the rucola, except for the fact that it was naked. No dressing. It was edible after V squeezed of lemon on top, but that's all we had. Some other notes: On the menu, there was a beautiful picture of baby lamb chops next to the lamb offering there. V almost ordered the lamb. I stopped her, pointing out that it said it was leg of lamb. We asked the waiter why there was a picture of lamb chops if they were not actually on the menu. "Yes, that confuses some people," he said. I'd also express my displeasure at one thing that did not stay the same. They used to have a black pasta with six big tiger shrimp that was not too expensive was one of my favorite meals in Prague. That wasn't on the menu. 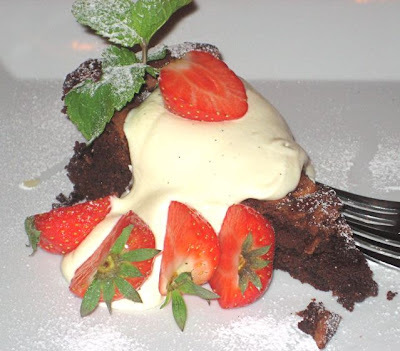 In the end, I decided to have desert and ordered the chocolate cake with vanilla mascarpone and strawberries (165 CZK). The cake was similar to a fudge brownie. The mascarpone had more of a tangy flavor than you'd find in tiramisu. But it worked. I thought they missed an opportunity to make the dessert really great by heating the cake. This one was served cold. 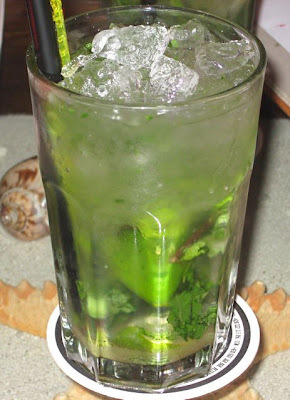 And finally, I'll talk about the real main course at La Bodeguita del Medio -- the mojito (169 CZK). We always get the "European" mojito, which is made with crushed ice. So much ice that it takes up most of the space in the glass. Even though there was so much crushed ice, they were quite strong and fairly sweet. They put a lot of brown sugar in the bottom of the glass, along with the mint, limes, and soda water. The Cuban version comes in a smaller glass with cubes instead of crushed ice. By my second mojito, I was feeling it. By the third, which I had upstairs at the bar, I was salsa dancing. Or conga dancing. No one could be sure. Another reason to call this a main course -- the price. With dinner, we had five between the two of us. That adds up to 845 CZK. The total bill for our dinner was 2408 CZK. Which is more than we usually like to spend, but the purse strings had come undone since it was my birthday. 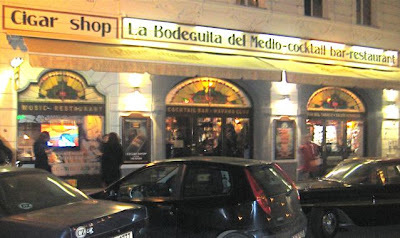 Looking back, I'd say I'm a lot like La Bodeguita del Medio. I've changed a bit since last year. Some for better. Some for worse. But, basically, I'm still the same. 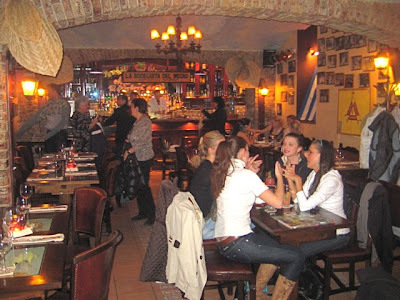 While visiting Prague in April of this year I ate twice at La Bodeguita. I thought the food was quite good and the Mojitos were strong, which is the idea. It was always very crowded so that made the people watching fun. The only downside is that it is a bit overpriced. On another note I enjoy reading your blog and fantasize about being in Prague through you. We need a picture of V! PS I love your blog. Keep up the good work. As for V, sorry, no photos. You'll just have to use your imagination. Happy Birthday Brewsta - see you back in Vrsovice. 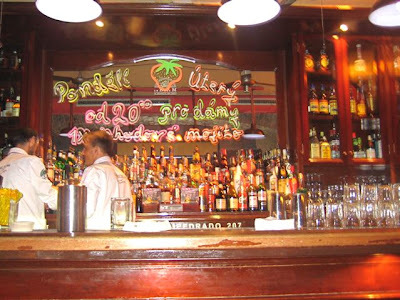 Hi, I was wondering if you know how the employees of the Bodeguita del Medio feel working there? I'm asking because here in Puerto Vallarta (Mexico) they aren't really happy. I don't know how it works in Prague -- though they've had the same bartender at the upstairs bar for many years. I read the post about the Mexican outlet. I worked in a restaurant in London a long time ago that had a similar scam. All bills had a service charge, but the waiters only got 4.5%. There are places in the USA that do things like that, but it is illegal. If someone takes the trouble to file a complaint, the restaurant has big trouble, but most don't have the time or resources or courage to pursue it. I'm sure the laws are not so favorable in Mexico.